When I went to Germany over the Easter holidays I saw many pencils, erasers and sharpeners that are difficult to find in the UK. One of these difficult to get ones are the Lego erasers. I have actually seen them in the UK, at Selfridges, but they were very expensive. In Germany they were fairly cheap: usually a pack of two sells for € 1.49 (~£ 1.30, ~$ 2.00), but I bought mine in the first shop where I saw them ..for €1.99 (~£ 1.75, ~$ 2.68). There is also a version with three erasers available (red, blue and green). The Lego erasers are manufactured under license by Senator, a company established 1920 and well known for their promotional ballpoint pens. They are one of the biggest manufacturers of ballpoint pens, producing about one million ballpoint pens each day, and their range includes unusual pens as well, e.g. biodegradable pens or the “only antibacterial pen approved to British standards”. 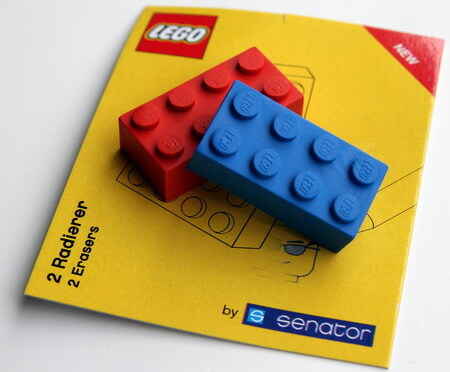 Before I saw the Lego eraser I was not aware that Senator made erasers, except maybe the erasers used in their multifunctional pens. The eraser is actually performing very well. I compared it to the Staedtler Mars plastic pen and the fantastic Faber Castell 18 71 20 on Bloc Rhodia No 13 paper, using a Faber-Castell 9008 Steno 2B pencil1. The performance of the Lego / Senator is as good as the performance of the other two, maybe a tiny bit worse, but that might just be my subjective impression. 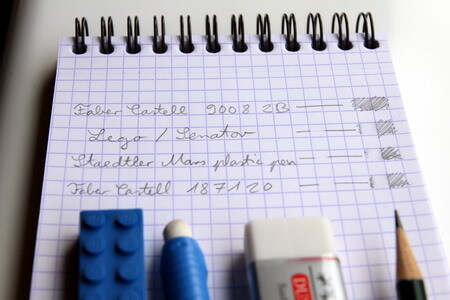 Compared to the Staedtler eraser pen you need to apply fewer pressure when using the Lego / Senator eraser. A good looking novelty eraser that performs well. Price and exchange rates: April 2010. Do the erasers have the underside that would allow one to snap them together like regular LEGO pieces? Unfortunately they do not snap together, the profile of the underside is wrong for that. They have three deep holes in the middle of the underside. I assume these holes are needed as part of the production process / because of the machines used. That’s too bad. But they still look better (at least to me) than most of the novelty shaped erasers out there. It would be nice if they could be snapped together, but I guess it was much cheaper to produce them this way.